ASSE was founded after this tragedy occurred. The American Society of Safety Engineers’ (ASSE) Board of Directors voted unanimously to hold its 100th year anniversary celebration in Chicago in June 2011. Founded in 1911, the Des Plaines, IL-based ASSE is a safety organization and represents more than 30,000 safety, health and environmental practitioners committed to protecting people, property, and the environment. ASSE was founded in October of 1911 in New York City after the tragic Triangle Shirtwaist Factory Fire that took the lives of 146 female garment workers– many trapped in the factory and many who jumped from the ninth floor to their deaths. 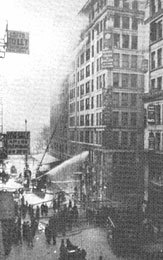 The fire occurred in March 1911 in New York City. At the time of the fire in the Asch Building the fire exit doors were locked and, reportedly, the only safety measures available for the workers were 27 buckets of water. Further hindering the workers’ escape was the fact that the ninth floor fire escape led nowhere and collapsed when used. Factory workers waiting for help at the windows watched helplessly as the firefighters found their ladders were too short to reach the stranded workers and the water from the hoses could not reach the top floors. There were no regulations in effect that would have saved the lives of the workers. After the fire, legislation requiring improved factory safety standards was approved. And, as it happens, the fire touched upon many lives who witnessed the tragedy including that of Frances Perkins, who went on to become the first female cabinet member and Secretary of Labor in the U.S. The Department of Labor building in Washington, D.C., is named after her. The 2011 ASSE Professional Development Conference and celebration will be held at McCormick Place with celebration events taking place throughout the city. ASSE has more than 30,000 occupational safety, health, and environmental professional members who manage, supervise, research, and consult on safety, health, transportation, and environmental issues in all industries, government, labor, and education.